Thanks for signing up to get my word-for-word negotiation scripts. I’ve made them really easy to use. You can cut-and-paste them directly into an email or pick up the phone and just read the words right off this page. Are you ready to save hundreds of dollars every month on your biggest expense? Get started with the proven scripts below. Email Script #1 – Are you paying above market rates? If you’ve done your research on rental rates in your area — on Zillow.com, Craigslist, or another rental rates site — and it looks like you’re paying more than you should, you can easily convince your landlord to reduce your rent. And many time, you can do it just by pointing out the data in an email. Start off with praise for where you live. Say you like living in your apartment, and you want to stay there. Remind your landlord of how good of a tenant you’ve been. You’re going to bring up the fact that you’ve been a great, reliable tenant month after month. You pay your rent on time, no maintenance issues, etc. Bring up your research. Mention that you’ve been looking at similar apartments in the area. And, while you were looking, you discovered that you’re paying a higher rate than others in the same area. End with a call to action. Finally, you’re going to ask if she’s open to discussing a rate adjustment. These 4 steps give you the basic framework for how an email like this works. But I want to show you a real-life example of this 4-step process in action. As you know, I love the apartment. I’ve gotten to know the neighbors and feel truly at home in the neighborhood. I hope to be able to stay here for a while yet. I’ve been looking at rental prices around the area, and would like to talk with you about adjusting the rent to match what I’m seeing around town. I’d also be more than happy to help out around the property —taking out the trash and recycling, clearing and cleaning the backyard, or any other duties that might need some attention. I love living here and hope that the relationship with you and the property is just beginning. I can chat on the phone any time you’re free today or this weekend. My analysis: What’s especially clever about this email is that Susan used something that I call The Sandwich Technique. The Sandwich Technique goes like this: Tell him something good, tell him something bad, tell him something good again. The bad news is “sandwiched” between the two good things. This works because it makes the bad news a little less abrasive to hear. Another reason Susan’s email is so effective is that she does not ask for the price she wants right away. That’s a classic mistake made by rookie negotiators. Think about how you’d approach someone at the bar. Would you instantly ask them to marry you? No, you have to get to know them first. The same thing goes when you’re negotiating. You never lead with the “ask.” You have to be more subtle at first. With an offer this generous, she gave her landlord, Jim, no reason to argue back. Finally, she throws in a very clever offer to help out with errands and chores. Now, she is prepared to do this, but Susan knows that in the vast majority of cases, landlords will not take you up on this offer. Instead, this serves as a “buffer” to make the landlord feel good about the question being asked. Remember, when your rent goes down, that means your landlord is making less money — so you don’t want to be unnecessarily aggressive. Now, let’s look at how Jim responded to Susan’s email. I understand. I hope we can come to some agreement as I too am very pleased with the relationships that have developed. I have not looked at rental prices in the area for a year and I understand that they have changed. What amount of adjustment are you asking for? My analysis: Note that he explicitly mentions “the relationships that they’ve developed.” That means Susan has successfully turned this negotiation away from something that’s simply about money and into a discussion. And a discussion is not confrontation at all. This is critical. Jim clearly wants an amicable solution here. If Susan leaves, that means higher turnover in his property. And it’s much harder for him to get new tenants than it is to simply maintain the ones he already has. In his email, he admits he that doesn’t have data on comparables at hand, but it does sound like he’s willing to at least see if this is true. He wants Susan to name a price. Here’s her response. Thanks for your response, and for putting your energy and attention to this. I’ve saved some listings for 2 bedrooms ranging from $1— to $1— that I’ve found in the Castro/Dolores Park area over the past month. I don’t think they’re currently live on Craigslist anymore, but I saved them as PDFs. I’ve seen 1 bedrooms starting from $1—, and I would love it if we could meet somewhere in this range. OK. After looking around, I think that $1,750 would be fair. Your thoughts? Boom. She got exactly what she wanted: a lower rent. And that simply interaction directly translated into an extra $2,400 for her over next year. That’s the power that a simple negotiation can have. But what if you aren’t paying above market rates? Do you still have room to knock down the price? If you’re paying at or below market price, you’ll probably need to offer a concession to your landlord. Otherwise, what’s going to entice him to reduce your rent. Otherwise, you’re not really giving him any good reason to do so. The email you write in this circumstance will be very similar to the 4 steps I outlined above. The only difference comes in step 3, where you’re going to make an offer. Make an offer. Mention that you really want to lower your rent. And you’re willing to offer them something valuable in exchange for a deal. Since my lease is almost up, I’d like to chat with you for a bit about resigning. I’d like to offer to pay you for (X months) of rent up front. This will give you immediate cash flow and the peace of mind that I’ll be here for at least that long. I know how important those can be to any business owner. In exchange, would you be comfortable talking about a monthly discount? You’ll have to adapt these scripts to your specific situation, of course, but they should be a good starting point for you 90% of the time. Note that by using words like “cash flow” — which are always present in landlord’s mind — you are speaking to them on their terms, not only yours. Now, email can work, but sometimes picking up the phone is the best way to get fast results. But don’t worry, with my scripts, you don’t have to worry about any conflict. Sometimes you’ll need to have this discussion over the phone or in-person. Maybe your landlord is old-fashioned or just prefers having this kind of conversation offline. YOU: Hi, how are you? It’s Jeff from apartment #7. I had a couple questions. Do you have a minute? LANDLORD: Sure, we can talk. YOU: First thing, I wanted to let you know that I noticed the bathroom sink was leaking, but I was able to fix it last night. I just used my wrench and it took 5 minutes, so things are great now. LANDLORD: Oh, that’s good to hear. Thanks for letting me know. YOU: So I was looking at rent prices in the neighborhood and I noticed they’ve dropped. As you know, I really like living here and would love to stick around. But after seeing lower rents for comparable places, I was wondering if we could talk about adjusting my rent to match the rates around town? LANDLORD: Well, I haven’t seen any major price drops, but what do you have in mind? YOU: Well, I’ve seen [comparable unit] for [lower price], which I think is reasonable. What do you think would be fair? Analysis: The first bit about the sink is just an example, but when you start negotiate, you’ll want to include something similarly positive to get things started. If you didn’t just fix your sink, don’t use that example. Be honest. But you should have recently done something positive for the property. Maybe it was raking the leaves, or fixing the broken hose, or whatever. This kind of helpfulness goes a long way. Remember, your landlord is your ally in this. They are not an adversary. Unlike conversations with customer service reps at your credit card company or bank, your landlord probably won’t be following a standard script, and, in most cases, there’s no set of rules governing the allowances they can or can’t give. I really like living here, and I want to stay. I’ve been noticing lower rents in the neighborhood. For example X, Y, and Z. Can WE talk about a possible rent adjustment? What do YOU think that would be fair? Going into negotiation can be tough. That’s why I encourage to spend a few hours practicing these 5 steps before you ever pick up the phone. By front-loading the work, you’ll ensure the conversation goes as smoothly as possible. Practice speaking your personalized Key Phrases at least 10 times before the call. Get someone to do this with you, or just talk at the wall or mirror. DO NOT SKIP THIS STEP. When you first try this, you will likely sound stilted and insecure. That is natural — but you want to practice first, instead of sounding like that with your landlord. The delivery you should aim for should be confident and friendly, not nervous and scared. Observe basic call etiquette: a quiet place, no distractions (or talking to other people), an appropriate time (business hours if yours is a professional property manager, evenings if yours is a single proprietor landlord). If follow-up is needed, get an agreement for a specific day and time now. Send a follow-up email to confirm and include any data you’ve collected. This will ensure that you not only get the best rate possible, but it will make things easier on you because you’ll be well-prepared. 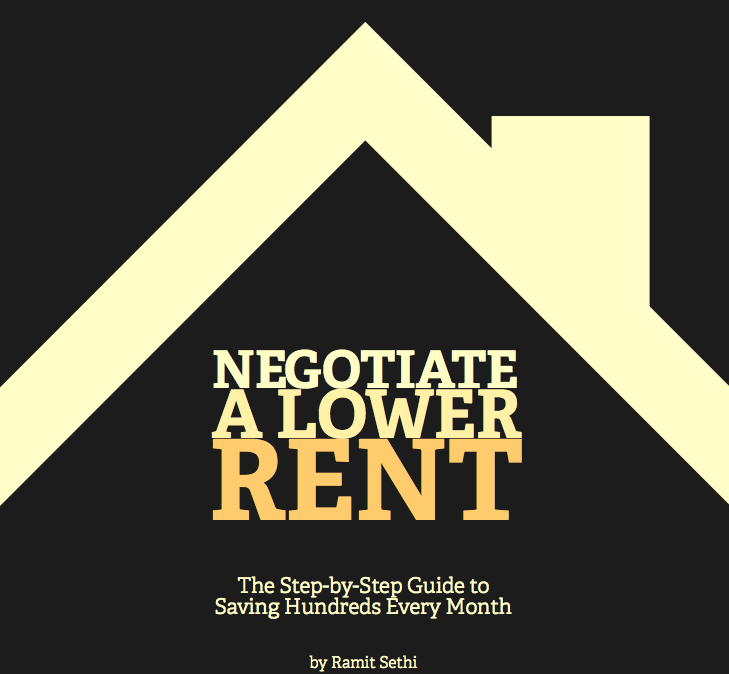 I hope you enjoyed this negotiation guide. If you know someone who would enjoy or benefit from any of these negotiation scripts, please feel free to forward this guide to them. If you’re interested in using negotiation tactics to earn more money or improve your career, you can check out this free, Ultimate Guide to Negotiating that I built. Thanks for reading. I’ll be sending you even more tips on negotiation and living a rich life soon.